There have been rumours for months, if not years, that student fees will come down. It has been a likely prospect ever since at least the 2017 general election. Then, Jeremy Corbyn copied Michael Howard’s stance at the 2005 election and Nick Clegg’s at the 2010 election by promising to abolish fees. Labour lost the election (just like Howard and Clegg), but the Conservatives’ failure to win a majority encouraged them to look seriously at how they might reduce student debt too. This led, in turn, to the announcement at the 2017 Conservative Party Conference of the Augar review. As is typical with such things, the review has been on an elastic timetable but it is expected to report soon. whether any fee reduction will be compensated for by increased grants from the Treasury. However, it is also worth thinking through how a fee reduction might happen practically, if it were to be recommended and if (big IF) it were to pass both Houses of Parliament. There are practical problems in reducing fees overnight. For example, universities and the Student Loans Company need time to prepare for any new system. Perhaps most importantly, if there were a significant reduction in fees, then many people who had planned to go to university in the very near future might opt to take a gap year. Remember, many of those who had planned to take a gap year in 2011 cancelled it to avoid being stung by the last big increase in fees (see the zigzag below). 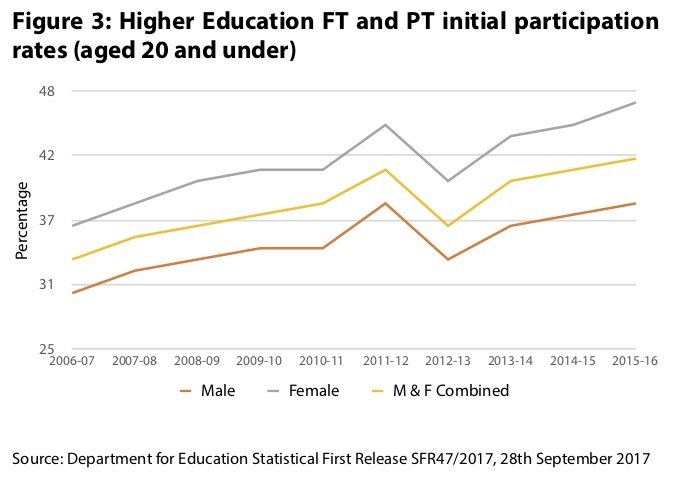 There could be serious problems for the higher education sector – in terms of cash flow, students’ accommodation preferences and staffing – if a single year were to see a big reduction in new students and the next year were to see a big increase. It is widely assumed that any fee reduction (as with past fee increases) will be for new students and gradually work its way through the system. But, if the reduction in fees does happen, it is worth exploring whether it should be implemented for final-year students in the first instance. In other words, for the first year of the new policy, it would be aimed at students who are already more than halfway through their time as an undergraduate – and not, as is generally expected, freshers. This would have two clear advantages, one practical and one political. As the people closest to graduation tend to be the people who are most aware of the large debts they have accrued and are typically about to join the labour market and therefore enter the repayment phase, they are also the people who are most likely to feel any gain – though it is important to note that lower fees have no effect on the pound in your pocket until much later (if at all), by bringing the date at which you extinguish your loan forward. Given that you are more likely to vote the older you are, any electoral benefits (if they exist) could be clearer too. There is an assumption that any fee reduction for freshers would take effect in 2021, in other words for people who are currently in year 11 and taking their GCSEs this year and who will start their A-Levels or equivalent this autumn and who will typically apply for university in late 2020. That provides sufficient time for them to be told before they complete their UCAS forms what fee they will be paying, for policymakers to make the necessary legislative and practical changes and for Conservative politicians to say at the next general election, which is currently due in 2022, that they have already started cutting student debt. But, imagine instead, the fee reduction is for final-year students only in the first instance. That makes it easier to implement, as the beneficiaries are already in the system and things like information in prospectuses becomes less relevant. Imagine too that the policy can therefore be implemented more swiftly, in say 2020, and is then gradually extended downwards. Reducing fees for longer-serving students first should, in theory, lead to loud protests from those who shouted loudly when the repayment threshold was frozen a few years ago on the grounds that ‘retrospective’ changes are morally wrong. Someone who was told their fees would be £9,250 could theoretically complain that they had been lied to, if their fees fall to £7,500 – after all, they will almost certainly be having less money spent on their education. But the principled opposition to retrospective changes seems only to apply when costs rise, rather than when costs fall: when Theresa May reversed the freeze in the repayment threshold and increased it from £21,000 to £25,000, there were no complaints about retrospectivity (even from the generality of taxpayers for whom the increase represented a very large cost). Of course, one way around all these issues is simply to reduce fees for everyone overnight. That is possible but it would increase the costs significantly, is out-of-kilter with other recent tuition fee changes and would produce a cliff-edge between those who went to university between 2012 and 2020 on the one hand and those who come afterwards on the other.